Runs on 120V input power and clean cuts 1/8” steel with built-in air compressor. Designed for increased comfort with an ergonomic trigger safety, more efficient cooling and economical replacement cutting tips. Runs on standard household power. No need for 240 volt hookup by utility company. Cooling system operates only when needed reducing power consumption and contaminants drawn into the machine. Ensures consistent arc starts prior to each cut, minimizes tip burnout. LED lights indicate system status for power, temperature, and torch readiness— eliminating unnecessary downtime. Built to withstand tough working environments. Rated for 35% duty cycle at 104° Fahrenheit. Duty cycle will increase as environmental temperature decreases. Extends life of consumables and torch by cooling them with postflow air after trigger is released. Replacement torch for Hobart Airforce 12ci plasma cutter with 12' leads. Electrodes specifically designed to work with Hobart Plasma Torches XT12R/XT30R/XT40R. Includes 2 electrodes. Plasma retaining cup, swirl ring and O-ring for the Hobart XT12R plasma torch. Designed for Hobart XT12R Torch of AirForce™ 12ci Plasma Cutter, use this kit to improve arc transfer and maintain a constant arc length. Joel Ort with Hobart Welding demonstrates how to create sunflower yard art using Hobart® products. 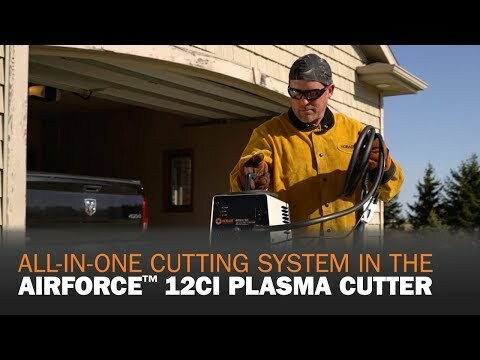 The AirForce™ 12ci Plasma Cutter is the most convenient and portable cutting system available. Get an overview of the plasma cutters in the Hobart Welding product line: Airforce 12ci, Airforce 27i and Airforce 40i.